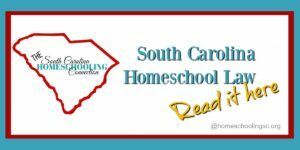 What's NOT Required by South Carolina Homeschool Law? 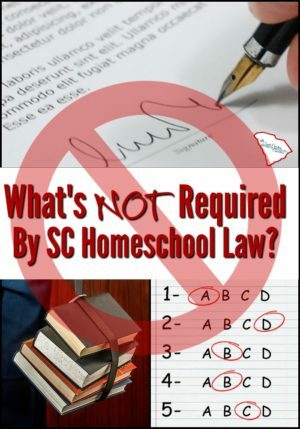 What’s NOT required by South Carolina homeschool law? 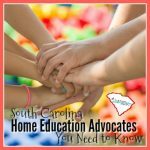 It’s important in know what homeschool parents ARE required to do and are responsible for according to South Carolina Homeschool Law. In previous posts, we’ve covered lots of topics about Getting Started Homeschooling. But, it’s also really important to know what’s NOT required by the South Carolina Homeschool Law. 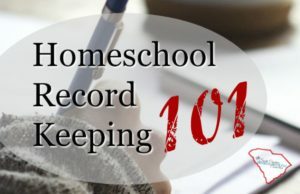 Where ever you homeschool, it’s important to know what’s not required in your state homeschool law, too. If you know what the law says–and what it doesn’t say–you’ll be able to stand up for your own rights and responsibilities much better. Knowledge is power. Disclaimer: Any purchases you make at Educents pay me a small commission. Homeschoolers can enroll with an accountability association instead. The association prepares an enrollment count for each school district in January. The names, birthdates and other personal information is kept private at the association. The only notification to the school district is the number of students in each grade level within their attendance zone. Note: If a student is withdrawing from a public school, then the school may need verification from the association before the student is removed from the school’s compulsory attendance rosters. The school’s are not supposed to take your word for it that you’re homeschooling now. You can deliver a letter from the association when you return the school’s books/materials or the association might fax/email it for you. Be aware that some school districts now have a district employee who is a “social worker.” Some of these officials are tracking down homeschoolers in their districts who have never been enrolled in public school or were withdrawn from a charter online school to homeschool. The official wants to verify the students in their attendance zones are actually enrolled with a homeschool association, even asking for details about the names, birthdates and addresses of homeschoolers. Essentially, they are asking for a letter of intent. Just know your rights and ask them to show you in the law where you are compelled to provide the information they want. The law does not specify anywhere that you should notify the school district about your enrollment. As a professional courtesy and to avoid a truancy accusation, your association director might verify that your family is enrolled without divulging details of your private information. Even if you use the school district (option 1) as your accountability, you are not given curriculum. When I chose Option 1, I wasn’t even allowed to look at the school’s textbooks to compare my curriculum choices. But, when a friend was called to truancy court, the lawyers and the judge wanted to know when curriculum was issued by the association. So, maybe it’s a bigger misconception that we need to clarify. Homeschooling is not a program. There’s no specific curriculum required by law–and no curriculum is issued by the accountability option. There’s not even a requirement to follow the scope and sequence of South Carolina’s state objectives for each grade level. It’s entirely up to the parent to pick and choose. The 3rd Option law designates some minimum guidelines about which subjects must be included in the homeschool program. It’s Reading/Writing (or Literature/Composition), Math, Science and Social Studies. You can add more, but that is the minimum. The law also doesn’t specify how long the homeschool day is or how long to spend on any given subject. Learning actually occurs every day, with or without textbooks. Our job as homeschool parents, is to document that learning. Some associations provide curriculum counseling services to help parents fill all the gaps and choose rigorous curriculum. Option 1 and some associations require parents to list out the long term plans or curriculum choices as part of the application paperwork. 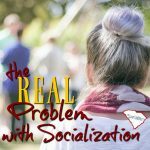 Some associations require specific curriculums or limited curriculum variations (especially for high schoolers). This is a handbook policy set by the association, not a mandate in the law. Many parents love the freedom and the flexibility in choosing curriculum plans. Others are a little intimidated by the responsibility and overwhelmed by the variety of options. So, choose an association that offers curriculum counseling services, if you need that. Just be aware of what the law requires and what additional services your accountability offers or requires. Note: There’s also no Learning Coaches in homeschooling. That is a term in charter school/online programs. The parent or another responsible adult assists the student (as a learning coach) during their daily assignments from the online public school teacher. 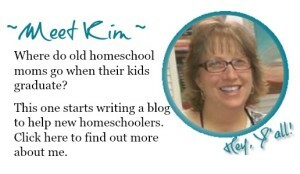 In homeschooling, the parent’s title is teacher or home educator. Another Note: The law also doesn’t specify that parents have to teach at least 51%. Some associations implement this requirement (and HSLDA recommends it). 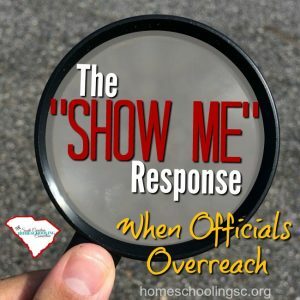 Associations actually had a dispute with the Department of Education in August 2016 whether ANY outsourced classes, co-ops and tutors were allowed under SC Homeschool Law. Read more about the Policy Issue Resolution with Department of Education. Homeschooling is a DIY education, but you are still allowed to sub-contract out as you wish. Option 2 & Option 3 homeschool laws do not require annual standardized testing. Testing may be a service the association offers or a membership requirement in their handbook. Some associations suggest periodic testing every three years, while other associations require annual testing. Just be aware of what the law requires and what the association policies require. The homeschool law (Option 2 & 3) does not mention standardized testing. The parent is legally free to choose which test and when to test…*if* to test at all. Very often, the parent already knows what the test results would reveal. When you work closely with the student every day, you already know their abilities and weaknesses. Some tests may emphasize pointless exercises, like speed drills or trick questions. Many public school parents are boycotting standardized testing requirements because of this. So, just know what you want the test to accomplish, why do you want the results, and when will testing help you get to those goals. Any purchases you make at Educents helps keep this blog running. Note: Option 1 law requires the homeschool student to take the state mandated test for each grade level. The students actually go to the school and take the test at the public school. Option 1 High school students must take the state mandated End of Course exams for English 1, US History and Constitution, Biology 1, and Algebra 1. Public schools will calculate the test results as 20% of the final grade in the course credit, though homeschoolers do not necessarily need to include the test results in their final grade. Any Homeschoolers (in Option 1, 2 or 3) who take these four high school courses from VirtualSC will be calculated according to public school policy. 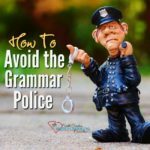 It’s important to know what the law says and what it doesn’t say. 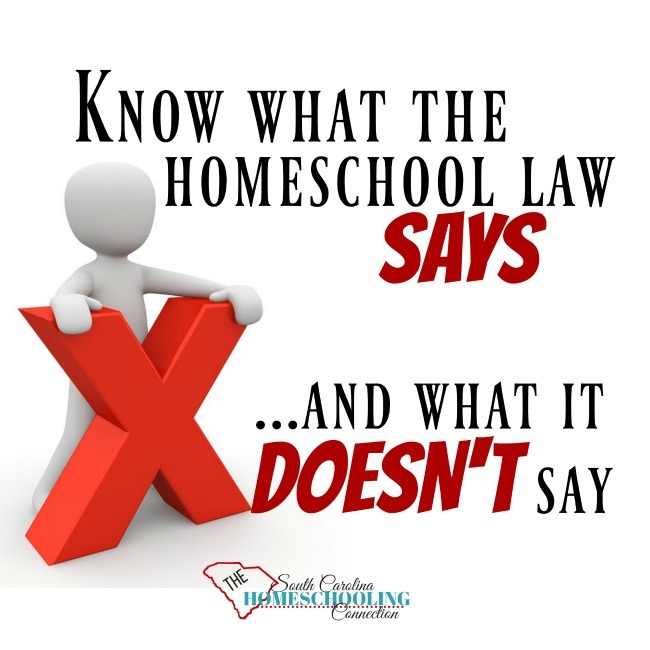 Be sure you know what’s NOT required by South Carolina homeschool law. Speak knowledgeably about your rights and responsibilities. Knowledge is power.